I worked for Samsung UXCA in the Mobile Lab for two years. One of the areas I focused on was "proximity." Some of the questions I examined included: Assuming we can detect nearby people, venues and devices, how should we interact with them? How should we promote interactions with "our" objects (our friends, our owned smart devices)? How could we promote meaningful interactions with our communities? We also looked at a number of technologies for detecting nearby people and devices, automatically detecting venues, and indoor positioning. My Role: Lead UX designer on these three concepts. One of my favorite projects in this research area was the Live Cards project. This app and service concept allows a user to share varying levels of information about himself while respecting both his privacy and his multi-faceted nature. Imagine a business card which you can switch out at any time between personal, social, or professional uses, as well as turning it off altogether. Only people in one's immediate vicinity would be able to see this card on their own phones. 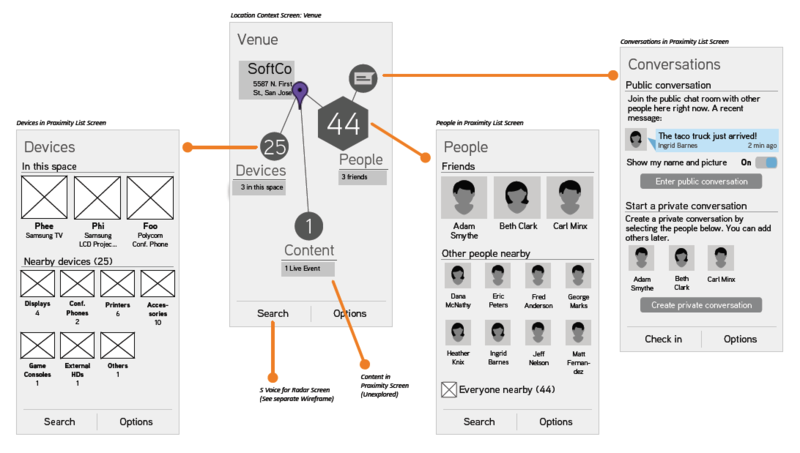 The wireframes below illustrate how the user has several Live Cards already configured within a "universal communications" app (Screen #2). For the context of this use case, imagine that you're the user (Frank) and you've just arrived at a professional meetup for other tech marketers. Therefore, you'd like to broadcast information about yourself as a marketing professional, and include a link to your LinkedIn profile. In Screen #1, we see that the "Public Profile" card is currently selected, though off (not broadcasting). 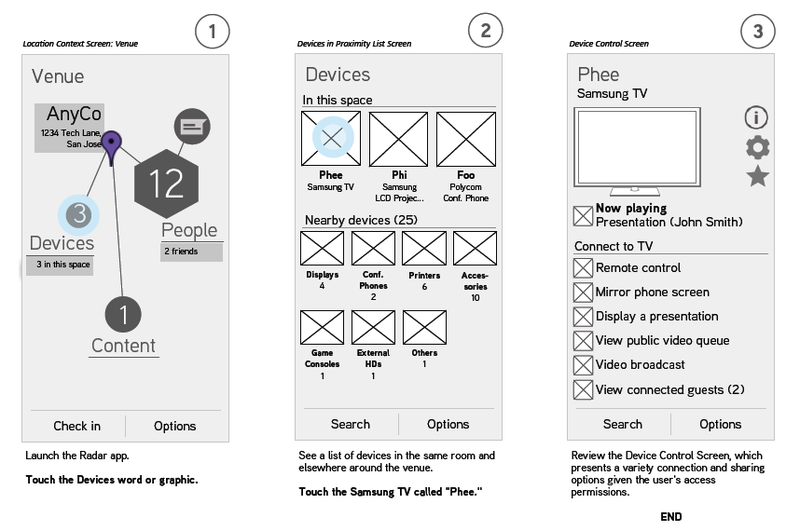 The use case illustrated over the four wireframes shows how the user hits the switch button (#1) to view a list of Live Cards (#2), selecting one, then turns on the feature (#3), thus allowing nearby people to view the card's info on their own phones. As you can see in Screen #2, the user can set up as many Live Cards as desired, each including different name values, different pictures, different links to social networks, and so on. The user can provide tags or descriptions about himself, as well. And of course, the user can turn off the feature, as well, thus going dark and being removed from the list of nearby Live Card users. Another app concept that I contributed to was called Radar. Radar leveraged my Context Framework concept to help the user interact with nearby people and devices, especially within a single location (or "venue"). People: See a list of people nearby, with friends broken out separately and highlighted. The phone can identify friends vs. strangers by cross-referencing the Contacts app, Facebook, etc. In addition, this concept gives each venue a live chat room automatically. Thus everyone can optionally engage in a conversation, thus enhancing community by breaking down communication barriers. Private 1:1 chats would also be possible. 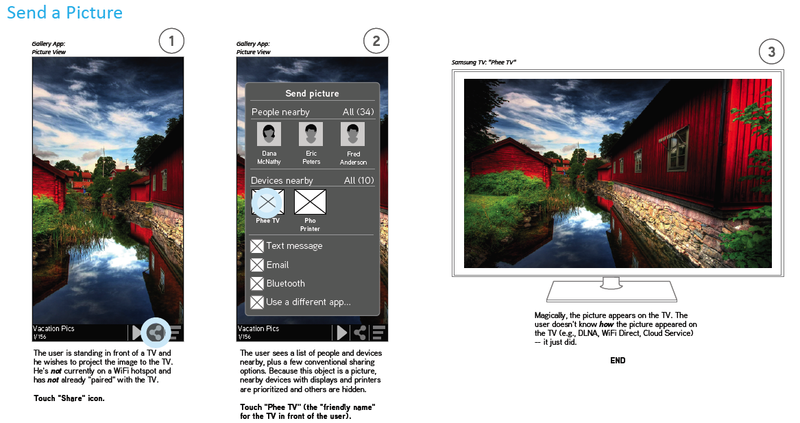 Devices: The phone can identify devices within the immediate area, such as printers, TVs, LCD projectors, etc. Ideally, devices in the immediate room (such as a conference room) would be prioritized over other devices in the venue which are further away. By selecting a device, the user could see more information about the device and what options are available, such as sending pictures, videos, and slides to a TV or projector, or a document to a printer. Venue: The app would also provide information about the venue itself by leveraging Cloud-based data sources, such as reviews, ratings, event schedules, Twitter and Facebook posts, Wikipedia information, Instagram pictures, etc. Certain venues might have additional functionality, such as a flight status tool for an airport. If the venue hosted live events such as concerts or shows, then there may be additional features to help guests share pictures and information more easily, and interact with the main attraction. We also looked at how proximity could change a few common interactions on the phone. In the below example, I modified the standard Android "Share" dialog to make it easier for the user to share a picture with friends and devices in the user's immediate vicinity.